How I get 300 to 500 hits on my Amazon Book Page EVERYDAY! ***Warning*** Before you purchase this book please be aware that Stampede goes against the usual Twitter marketing advice for Kindle eBooks. Please do NOT purchase this book if you are at all scared of going against the normal conventions. However, if you are a bit of an outlaw, someone who doesn’t mind sailing against the wind and trying new things, then Stampede is most definitely for you. After only doing 'some' of his suggestions, I'm already getting traffic to my book pages. It doesn't always translate into sales, but after setting up the system once, I'm getting a steady flow of hits to my books. And, yesterday, I hit it right with one of the hashtags (not sure which one) and got 3 sales I probably would not have gotten without this book. If you are an Amazon Kindle author, or anyone looking for strategies to use Twitter to drive traffic to a web page, and you're not already an auto-tweeting hashtag-master, then this book will probably be as beneficial to you as it's been to me. Thanks Gary for helping me build my audience and sell more books. Stampede is an amazingly successful Kindle marketing system that’s free, it works on autopilot and once its set up it will continue to send masses of customers to your Kindle book page 7 days per week, 24 hours per day. Stampede teaches you how to write highly intriguing tweets based on quotes and testimonials from your own books. It then shows you how to carefully select far-reaching hashtags used by customers who read your types of books, which you then add to your tweets and tweet them using an AutoTweet program. Set and forget. Normally, your tweets only reach your own followers, but a careful selection of hashtags allows you to reach far beyond your own followers. In fact, you don’t even need any followers of your own to make Stampede work. It levels the playing field for beginners and best sellers alike. Update from @KristyBerridge- as of 18th November, 2014, she’s now averaging 1,230 clicks per day on her Kindle page. For anyone frustrated over a lack of response from social media, I guarantee that if you implement my Stampede strategy, even in its most basic form, you will see masses of people visiting your Kindle page day in day out. 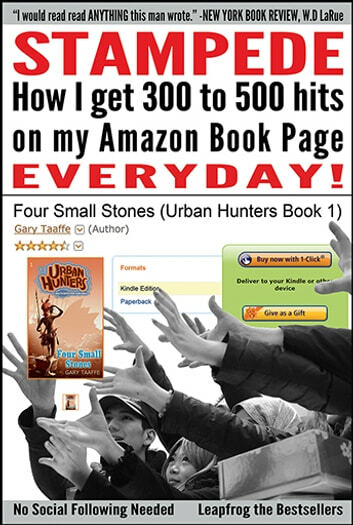 And you’ll know they’ve visited because I’ll show you how to set up simple hit counters for your Amazon book pages.